It is crazy to think we are already one full month into 2019! Just a couple weeks ago I published our record breaking December dividend income. Then a few days later the 2018 dividend results were published that were even better. Now into the new year, I’m very excited to see our dividend income portfolio grow even further! Just a quick overview of our portfolio – it currently consists of 35+ publicly traded companies and is part of our long term financial independence (FI) plan. One of the things I really enjoy about investing for dividend income is that when the market drops … my wife and I don’t panic. Instead, we buy more of those awesome companies that will pay us a steady income … just at a discount. Our long term goals are to eventually use our passive dividend income stream to cover a portion of our monthly expenses. Hopefully around 50% of our spending can be covered from dividend income. Based on some back of the envelope calculations, we could expect our dividend income to double every 9 years (or so) if we were to leave it alone. So in less than 20 years, we should be earning $30,000 annually in dividends. At that point, we should be generating enough dividend income to cover at least half of our current spending. Today we are reporting our latest monthly dividend income results. Here is a breakdown of how we earned over $400 last month in dividends. In total we had 9 stocks pay out a dividend in January, along with our bond fund. Just like every month for the past year … we earned dividend income in both our taxable and tax deferred accounts. Fantastic dividend paying companies like Cincinnati Financial, Altria, and Walmart paid our family a bit of money … just for owning shares in their company. Here is the breakdown of dividend income (by stock) in January from our taxable accounts. The following stocks are held in our Robinhood, Fidelity, and Computershare accounts that will be reported as income earned in 2019. Note – All of the dividends we currently receive are reinvested into new shares of the same stock using DRiP regardless the type of account. The only exception right now are any dividends received in our Robinhood account. Robinhood doesn’t offer DRiP, but at some point all the funds we earn are invested back into shares of a dividend stock. Looking back to last January (2018), we earned $305.12 … so we have increased our dividend income by over $100! My favorite monthly personal finance task is to update the dividend income we earned in our tracking spreadsheet. It is a really cool feeling to watch our dividend income grow month after month and year after year. This is probably one of the best ways to stay motivated in hitting our investment goals. Even cooler than reporting our dividend income earnings, is tracking our future dividend income growth. We track this by reporting our future annual dividend income amount in each of our monthly posts. This is a very simple calculation that takes the number of shares we own of each of our stocks and multiplies it by the current dividend of the company. The result is the amount of income we could expect to earn over the next 12 months … if we walked away today and never touched our portfolio again. How awesome is that? Of course this calculation assumes the company’s we own will not cut their dividend, which is unlikely (but not impossible). Let’s take a look at how we grew our dividend income in January from these 3 different methods. New investments were limited for January in our taxable and non-taxable accounts. We have been focused on investing more dollars into building our 457 account through my work. This year we plan to hit the max limit for 457(b) contributions of $19,000. Doing so will help us to keep our federal tax bill at $0 for the year. We have a goal to invest $10,000 of new money in 2019 in our dividend stock accounts. For the year, we have invested $382.45 in new money in our accounts. We are now $9,617.55 remaining to invest in order to hit our annual goal. Most of the stocks we own are setup to reinvest the dividends back into more shares of the stock. A few exceptions include any stocks we own in our Robinhood account. This is my absolute favorite way to grow our future income (and the easiest) … which is from company dividend increases. This is truly a passive income stream that will grow each and every month all on it’s own. The month of January had 5 dividend increases from companies we own shares in. 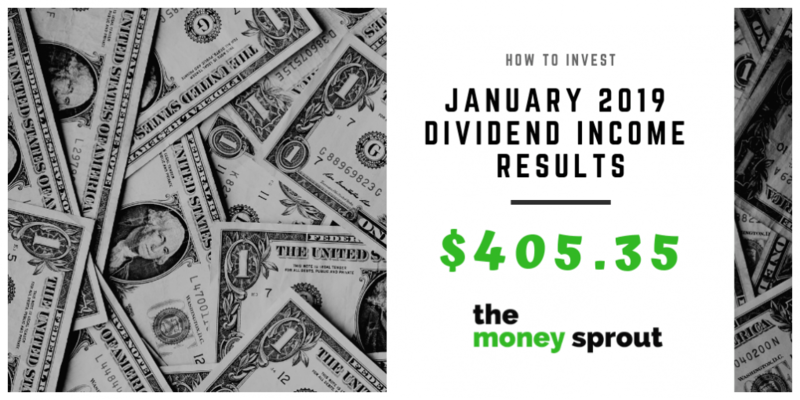 Note – This is down from last January’s (2018) future dividend income gains of $40.66. The increases were much higher last year from what we are seeing so far in 2019. The good news is because of these company increases that our dividend income stream will continue to grow every year … even if we never invest another penny. We started the new year (2019) with a future annual dividend income total of $7,477.26. That number represents what we could expect to earn in dividend income this entire year … if we never invested an extra dollar, reinvested any dividend income, and no company provided a dividend increase for the next 12 months. So far in just one month, we have grown our future dividend income by almost $43 to $7,520.19! We are looking forward to pushing past the $8,000 future dividend income mark sometime in 2019. By using the Rule of 72 calculation below, it helps us project out when our dividend income will double by using our future dividend income calculation. At the start of last year (January 2018), I started publishing the rule of 72 projections for future dividend income in our monthly reports. For more information about the rule of 72, you can check it out here. Basically, it is a calculation that shows how often your investments will double. Using the rule of 72, I have calculated (conservatively) that our dividend income will double every 9 years … without doing anything. Based on this, I can calculate out how our dividend income could grow (and double) based on our future annual dividend income number of $7,520.19 … that would be earned on February 1, 2020. Our updated figures tell us we should be earning over $60,000 per year in dividend income by February 2047. That would actually also be our dividend crossover point … where our dividend income would cover 100% of our spending. Personally, I don’t want to wait that long for our crossover point … which is why we still actively build our portfolio. 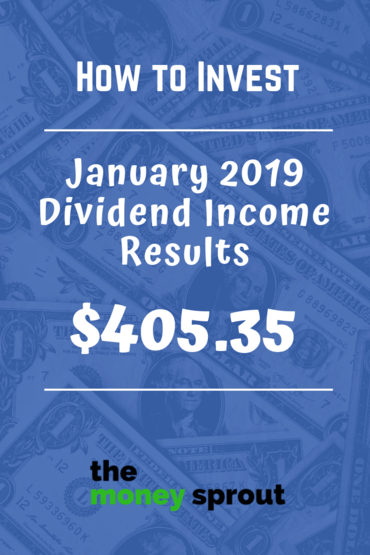 In January, we earned $405.35 of dividend income from our tax deferred and regular brokerage accounts. This was our largest January dividend income month ever … as we blew away our past January high of $305.12! The dividend income amount could cover our monthly van payment plus it would likely cover our water bill in January. My wife and I have set a long term goal from this dividend income portfolio to cover at least half of our monthly expenses … which right now is about $2,500 (our monthly spending is currently around $5,000). Our family would have a lot more flexibility knowing half of our monthly expenses could be covered by our passive dividend income stream. That is a refreshing feeling. The goal for 2019 is to earn about $8,010 in dividend income from all our accounts. After 1 month, we are $7,604.65 behind our goal. Not to worry though as January is usually our lowest dividend income month. And December (2019) will be over $1,000 of income again like last year. So far for the year (2019), we earned $244.84 in pretax accounts while the remaining $160.51 was earned in our taxable brokerage accounts. Finally … we managed to raise our annual forward dividend income in January by over $40 to $7,520.19. This is basically the dividend income we would expect to earn starting today over the next 12 months … without doing anything. I look forward to an awesome 2019! Full Disclosure – At the time of this writing, we owned shares in the following stocks and funds noted in this post – CAH, CINF, CSCO, DIS, GPC, MO, O, SYY, WMT, XOM, VTI, VYM, and FXNAX. The material above is not a recommendation to buy. Please do your own research on a company before deciding to invest.